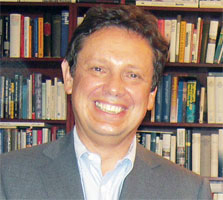 FRANK SCHIRRMACHER is a an influential German journalist, essayist, best-selling author, and since 1994 co-publisher of the leading national German newspaper Frankfurter Allgemeine Zeitung (FAZ), where he is Editor of the Feuilleton, cultural and science pages of the paper. He is the author of the bestselling Das Methusalem-Komplott (The Methusaleh Conspiracy), a book, published 2004 in 14 languages selling more than 1 Million copies in Germany, prognosticating the ageing of society as a result of low birth rates and appealing for an "uprising of the old". In 2006 Nobel-laureate Günter Grass in an interview with Schirrmacher admitted to have served in the Waffen-SS as a young man. Grass made the admission in a conversation with Frank Schirrmacher referring to his new autobiography, "Peeling Onions". said he was drafted at the age of 17 into the Waffen-SS - the combat force of the SS—in the final months of World War II. The interview stirred up a worldwide debate and forced Grass publisher to publish the book earlier than intended. Schirrmacher has received many prizes and honors including the International Corinne Book Prize. And in 2007 he was awarded the "Kulturpreis Deutscher Sprache" which is among the highest cultural prices in the German speaking world. Newsweek has named him one of the leading Germans in the 21st Century. His most recent book is Payback: Why in the Information Age we are forced to do what we do not want to do and how we can recover control over our thinking.